Before I start this review, I'll just tell you this: this is separate from the sequel movie announced by KyoAni. The movie is scheduled to be released in January 2020. Also, I wrote this review assuming you watched the 13 episode series first. If you haven't please watch that first (though I doubt anyone would come here without watching the main series first). While doing so I'd recommend you to watch this between episodes 4 and 5 since that's when this is set. 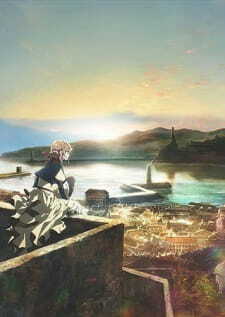 Violet Evergarden Special is an unaired episode which is set between episodes 4 and 5 of the 13 episode series - between Iris' visit to her hometown and the one involving Princess Charlotte's exchange of letters with the neighboring country's prince. No wonder there was a time gap of a few months between those 2 adventures. Since this happens in the first half of the series we don't get any information about Gilbert's situation after the war. Therefore he does not appear (in a flashback yes, but it was shown before). In addition, for those wanting to know whether this episode has adapted part of the LN, this is an original episode. Now, just because this is 34 minutes long does not mean that there's not much to say. In fact, this is probably one of the most important (personally one of the best for me) episodes in the series. The main reason is because this is when we can clearly see Violet struggling to write a letter for her client. In fact, it's the first time that Violet is taking care of a client all by herself (though technically she does get some help - after all, she's not experienced at this point). It also explains the time gap between episodes 4 and 5 - how did Violet manage to get a chance to write letters for a princess only after a few months from graduating? The episode involved Violet writing a love letter for an opera singer. Bearing in mind that Violet is still in her learning stages for writing letters, we are shown her struggles a number of times, which is pretty obvious since Violet still doesn't know what 'I love you ' means. She manages to get help from her colleagues to improve and meet the singer's expectations. Just like other episodes about Violet's adventures, we get a glimpse of the client's past, which involves the painful loss of her love partner during the war. I won't spoil beyond this point, but you should probably know the conclusion from most of Violet's other adventures. But how does this answer the question I mentioned before? Well, since Violet learns how to write love letters here, this is probably the main reason why her writing skills were significantly better than before in episode 5. It also partly explains why Hodgins chose her to handle an important client like Princess Charlotte - Cattleya was writing on the other side while Iris and Erica probably didn't have any experience writing love letters for important clients like Violet. One of the "great many jobs" included this episode. Now some people may say that this isn't enough, which I perfectly understand, but 1 episode is better than none. If I was to point out a major flaw, it would be the teacher's recommendation for Violet to write the letters. I mean, she only saw Violet write one letter... I don't think that would have been enough to be so sure to take care of a hard task like this. Overall, I'll give an 8 for bridging the time gap. Maybe it's just me but watching this after almost 2 months since the main series finished made me appreciate the art a lot more. I'm no expert in art, but everything was flawless to me, maybe even too flawless. My favorite parts were the water fountain scene and the candles. Just can't get enough of them. A new addition in terms of sound is the singing of the opera singer - her voice was really overwhelming and managed to captivate the audience's attention, including me. Without this episode, Violet's development would've had a huge gap in her path to improve her writing skills. This was a massive plus for me and it's also why I give an 8 for character. Some people might argue that whilst this episode did help to cement the cracks of her development, the pace at which this occurs may still be too quick. I think it's understandable since all of her adventures involving clients are only 20 minutes long. I personally think this episode should've been included in the main series in the first place, to bridge the time gap between Violet's first and second adventures, which could have reduced complaints by some people questioning Violet's quick growth. Regardless, I still enjoyed this episode. Would recommend, though you may not be satisfied. I have just now finished the 14th episode of your anime series, and have decided to review it in a letter format in this letter that I direct to you, to tribute the show. Unfortunately, I have come to regret this decision already at this point because it would seem that everyone and their mother had the same damn idea. You have to excuse me, but I haven't written many letters in my life. In fact, the last time I "wrote" a letter was when I was 4 years-old. It was with the help of a girl next door who was 3 years older than myself. She helped me to send one to the Santa Claus, but that guy fucked me over and brought me the wrong Turtles toy. Since then, I haven't been much of a letter guy. I will try my best, nevertheless. There was one bigger issue with your anime and that was its quality differences. Some of the episodes were stunning visually and emotionally. Others, on the other hand, mainly worked as a prove that character-centric drama doesn't really deliver in the episodic format all that well. It's not the easiest thing to find emotional connection to characters who one has known for 15-20 minutes. The absence of depth had its toll. Your 14th episode does few interesting choices. The first one being the duration of this episode as it's over 10 minutes longer than episodes 1-13 were, being over 34 minutes in length. Perhaps needless to say, but the extra time does miracles and serves the episodic nature of the series and its drama in a manner that I started to wish the other episodes had been as long as well. I know, it's so easy to say it now, but better late than never.. or something. To state an another thing that stands out: the music. I personally do not remember a single song from the original OST at this point anymore. None of it stayed with me nor remained memorable. But this time, our very story centered around an opera singer, and she surely can sing! The whole episode even reminds me of Nier Automata's OST and the Opera Singer boss fight from it. What type of content presses someone's buttons and makes them emotional is obviously a very personal thing, but to me, this time the content was made in such a convincing manner that your 14th episode became my 2nd favorite of the whole series after the one where you went star-gazing. I wish I had been there with you. Call me corny and cheezy. I still have to pity those (at least the tiniest bit) who were hyped over your 14th episode because it was rumored to be a sequel to the series, but was really episode titled as "4.5". That's hardly a surprise as we are talking about Kyoani here. This episode is still well worth of a watch to anyone who liked the original series. Not only that: I will go as far as recommend it to anyone who thought the show was average or bad even (I am sure you knew that people like this exist as well), but was able to find some beauty from some of its episodes anyway. There is a great chance that this special is what they wanted from the series in the first place. Ps. is this how you end a letter? I have no idea. pps (or is is pss), that doll around 9 minutes mark was still there. Nice meme. To put it simply. This is a much better ending than the original. I felt the action and how fast everything seemed just didn't fit the rest of the show. But thankfully with this, we got a much more natural and satisfying ending for such a great show. The comedy actually seems to be a thing here. Not saying there wasn't any in the original 13 episodes. But It usually was dominated by a more melancholic atmosphere. Some funny scenes such as Violet looking confused at everyone in an audience clapping or walking and standing in a corner. I do wish we got more of this in the original. The show did do something I was originally wanting. That is to have civilians bring up Violet being in the Military and not act like that's something completely natural for a Women. It was short lived but was nice to see none the less. I do still wish we got something such as at the end of the season show Violet returning to the little girl in Episode 10 and raising her after her mother passes away. Would be nice seeing Violet care for a child and seeing her grow as a person. Have maybe a short time lapse of a 1 or 3 years after Violet started taking care of her and show us a more expression filled Violet and actually smiling while taking care of the girl. Overall I feel this still holds up the quality of the original and is a better ending than the original. "Can I put 'love' to words, when I don't know what 'love' is?" The episode begins with a stirring operatic aria accompanied by an orchestra. At first I thought an actual opera singer was doing the vocals, but nope, it's TRUE. Dayum, that gal has pipes. Since her voice acting resume is probably nil, Yoko Hikasa voices the part of Irma, the singer. This episode is an anime original, and is positioned between the first arc and the second, indicated by Violet's limited emotional expressions and her military report "letter". As a transitional episode between those 2 arcs, it's pretty good, and something I wish I'd seen in the broadcast. The difference in Violet between the end of her training and her first solo field assignment in the show was a rather substantial shift in character, and so this is kind of like the bonus episode connecting the second and third major arcs in the Hyouka anime. I'm not a fan of writing that's like "I'm going to be coy about it until the end" (because that makes characters that are like "You need to read my mind before you see me doing anything useful"), but at least they wrapped it up in one episode rather than spread this out over 2 episodes. Now, this doesn't mean I want the plot spoiled within the first 5 minutes, but I'm not inclined to play detective or mind reader because the show isn't giving me any hints. A later episode masterfully used foreshadowing in a way that the writers for this episode clearly failed to grasp. This episode's theme is "The voices of war's victims". They were clearly going for the feels in the "letters vault" scene, but it was more of a pinprick than a body blow. Here, they told the story rather than showed it in the previous scene, which in my opinion diminshed the intended effect; the "50 years of letters" sequence in the TV series was much better executed, because you got to see the recipient's reactions. I think a fuller impact of this theme is in Saving Private Ryan (specifically John Williams' Hymn to the Fallen) or the finale of YuYuYu's second season. The scene was a step in the right direction, but only a step; the soundtrack is still a part of the scenery rather than an integral part of the drama (its greatest weakness). There's more of a reliance on using voices at the critical moment than the studio's principal strength, animation-- there's a similar scene in Clannad that is way more powerful because it supported all those voices with animated scenes. As always, writing drama is Hard. This is a good solid attempt, but the impact was limited because the writing was "good enough" and little more. Is this really a sequel or just an extra episode?